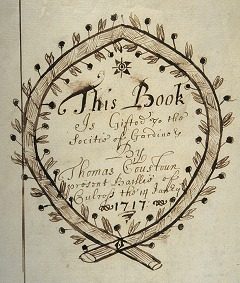 Documents are sometimes the best surviving source for the detail of gardener societies, their members and their activities. 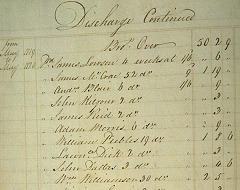 Most 19th century societies published annual accounts. Sometimes these are bare financial statements but others list officers and a few contain potted histories of the lodge. In addition to the statutory returns each lodge maintained a set of business books. The survival of this kind of material has been mostly down to chance. In some instances, significant records have been preserved by the foresight of the last members or their executors. But mostly all the business records of a lodge will have been lost with perhaps only a stray volume or two finding its way into a library or archive. Minute books record the events and business conducted at meetings of the lodge or individual committees. They often record new members, notes referring to sickness claims, fines and lodge events. Some include a register of members and, at the very least, a record of elections to committee posts. The very best will be full of gossip and anecdote. Treasurer's books and accounts record the full financial history of each lodge. 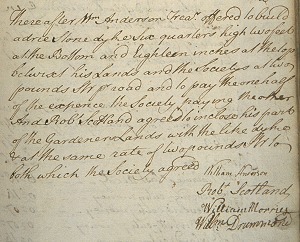 There is often a wealth of membership detail, showing both payments made and received. Transactions involving the administration of lodge property and all manner of day-to-day transactions are listed. In addition to the more formal books of each lodge other more ephemeral material can survive. Such items usually refer to particular events such as special campaigns, competitions, or meetings. All this material is scarce, but some Victorian posters have survived, like the example here. 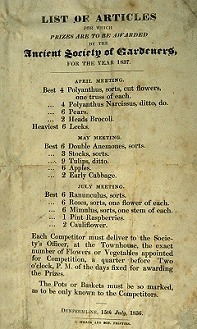 Haddington made sure that its members were always formally invited to the AGM. 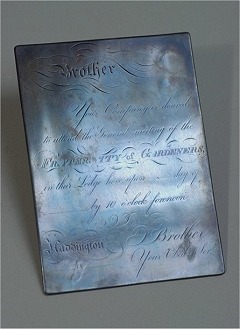 To save money they bought their own engraved copper plate, which would be handed to a local printer whenever more invitations were needed.